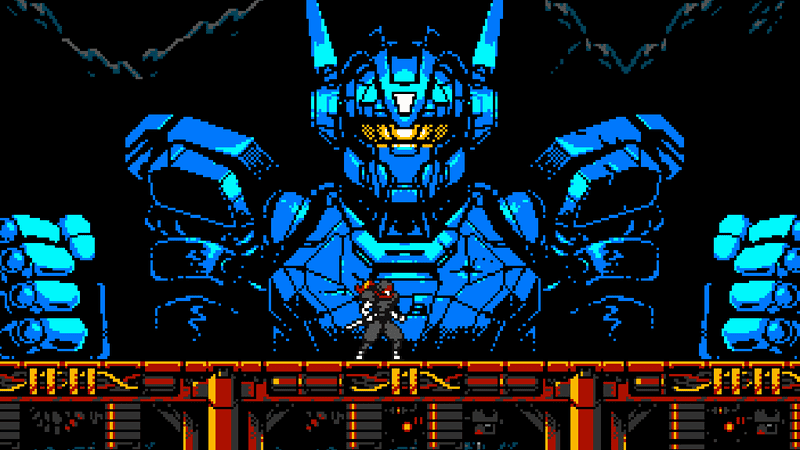 Cyber Shadow is a retro-looking action platformer that that looks beautiful and controls just as tightly. There have been a lot of those recently, like The Messenger, which channeled Ninja Gaiden, as well as Bloodstained: Curse Of The Moon, a mini-ode to classic Castlevania. Cyber Shadow isn’t entirely original in that regard, but based on two of the stages I played here at PAX East in Boston it’s as good as any of them. You play as a ninja trying to rescue the rest of his clan from a master-race of robots that’s harvesting them for their ancient, mystical ninja powers. Using a sword, your jumping prowess, and special ninja abilities acquired from destructible objects littered throughout the world you navigate a series of stages that play like a mixtape rather than one-to-one homages of some classic games. There are elements of 8-bit Ninja Gaiden, some Mega Man and the snaking paths and occasional backtracking of a Castlevania. Aarne “MekaSkull” Hunziker, the game’s creator, told Kotaku in an interview that there are other influences as well, including Batman on the NES whose bold, black-based backgrounds sit in strong contrast to more colorful contemporaries. Cyber Shadow is a passion project for Hunziker, what he called “a gift to myself.” While Yacht Club Games, makers of Shovel Knight, are publishing the game and assisting with QA testing, the only other people involved are composer Enrique Martin and sound producer Jake Kaufman. The gameplay isn’t shallow either. At the end of the demo, with no introduction, I was thrust into a fight with a cyborg ninja dual-wielding an assault rifle and a katana. Even without any narrative dressing, the stakes were palpable, and the encounter took on an interesting arc of its own as I realized the a fiery ball of light orbiting my character could be manipulated like a yo-yo by timing my movement and attacks correctly. Rather than fighting the cyborg head-on I was able to rip him apart by dodging his other attacks. For the most part. I was able to take him within an inch of his life before dying myself.